No longer would we be buying a jogging stroller just for running. High-end and athletic/outdoors-minded strollers like the Sport Utility Stroller model from BOB Trailers Inc. have graduated for many parents from niche item to the utilitarian world. Our “one stroller to rule them all” would have knobby tires and suspension for off-road bumps. We’d use it hiking with our new baby boy, for jogging paved paths and sidewalks, as well as for everyday use around town. The criteria was simple: As long as the stroller would compact nicely for transport, adjust easily, and steer manageably indoors when needed, then why wouldn’t we use it every day? Coming to the market this year with a revised color scheme and a few tweaks to the suspension system, the Sport Utility Stroller represents the top-of-the-line when it comes to jogging strollers. It has three fixed (non-turning) wheels for tracking straight with inflatable tires and knobby tread. A hand brake, a suspension system to dampen bumps, a retractable canopy, and a seat with a five-point padded harness for safety round out the package. 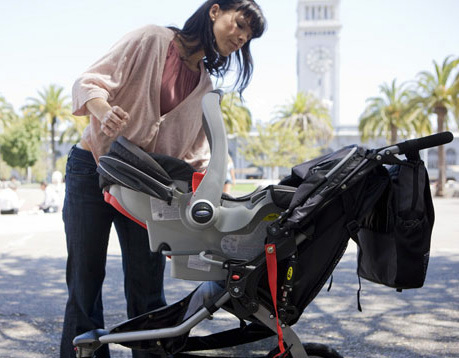 At $379, the stroller is also among the pricier you might buy in this genre. But with its multifunctional nature, my wife and I made the choice to put down the money. We’ve hardly been disappointed. We tested out the Sport Utility Stroller model with the Infant Car Seat Adaptor product for a few weeks when our son was just born. Then, as he grew (roughly at 8 weeks by manufacturer recommendations), we ditched the car seat and strapped our son right into the BOB stroller seat. The company makes infant car-seat adaptor kits to fit many models of car seats on the market. Installation was simple: Two metal bars slid into the BOB stroller seat area, and you can then click the baby car seat right in place. Using the infant adaptor with a car seat places most of the weight toward the front of the stroller so that your baby faces you while you push. Certainly, it’s a design consideration made for safety reasons. But since the Sport Utility has a fixed front wheel, having all of that weight on the front makes the stroller difficult to steer. It’s a compromise, though one that you won’t have to live with for long since your baby will soon outgrow his or her infant seat. Once we moved our son into the main stroller seat after a few weeks the balance was much better. Turning is significantly easier without the weight being forced forward. We can now maneuver tight turns, push and run with the kid. Hikes on dirt trails are easy. 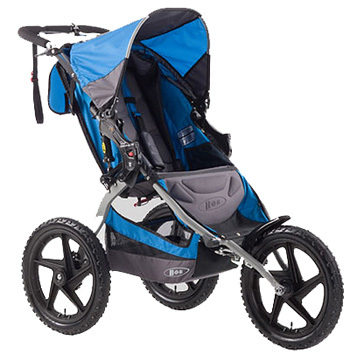 The stroller is built well, and it remains solid while pushing over rocks or through rough terrain. Folding the Sport Utility up for transport is a breeze. You grasp two levers off of the main handle of the stroller, push the top forward, then grab a cable near the storage basket and pull toward you. It folds up reasonably small considering its initial large size, though fitting it in some cars can still be tight. 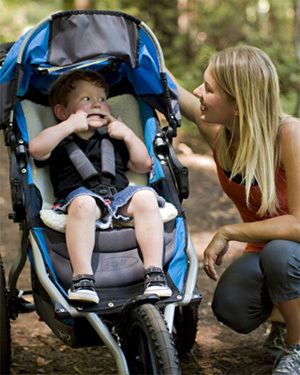 Overall, the Sport Utility has met nearly every need that we had for a stroller. It is lightweight, easy to assemble, durable and provides a smooth ride. All of the hardware has great build quality, with buckles snapping securely, the brake stopping assuredly, and the user-adjustable pieces being simple to figure out. With a price tag of $379 for the stroller and $59 for the infant adaptor, the Sport Utility is an investment. But if you are looking for a stroller that will last for years, this stout kid-pusher from BOB will meet that mark. next:Contest: Do You ‘Like’ Gear Junkie?